K-beauty vs. J-beauty — Is It a Competition? Is it really such a competition, though? Are Korean beauty and Japanese beauty so diametrically opposed? Or are they maybe much more similar than people think? Fundamentally, Korean and Japanese beauty have the same ideals. This isn’t a surprise, given how Korea and Japan (and China) have historically been very intertwined (not always happily). There’s been a lot of mutual rubbing-of-shoulders, so you may find that Korean beauty and Japanese beauty (because these are the two up for conversation, not to disregard Chinese beauty) actually have more in common than not. Both K-beauty and J-beauty are highly regimented, and they’re both big proponents of the double cleansing technique, especially at the end of the day when it comes time to remove makeup, cleanse skin, and let it rest and heal overnight. They also both focus on hydration and layering, preferring gentle products that won’t aggravate or irritate skin, even when it comes to exfoliants — both Korean and Japanese beauty look for ingredients that are effective but also gentle, soothing, and calming. K-beauty and J-beauty both take the preventive approach, instead of the reparative. They want to prevent wrinkles from showing, dark spots from happening; they choose to anticipate these skin problems and try to get ahead of them, instead of treating them once they happen — it’s why people in both countries tend to start their skincare regimens when they’re as young as middle schoolers. Further, they both respect consumers, understanding that consumers in Korea and Japan like to care for their skin and invest both time and money in skincare — they know that consumers educate themselves about skin and their skin needs and, therefore, expect the best from their products. They also both pull from traditional ingredients. People commonly speak of traditional ingredients when they talk about Japanese beauty, while Korean beauty is often given descriptors like “innovative” or “trendy,” when the truth is — both Korean and Japanese cultures go back centuries, and both present-day Korean and Japanese beauty cultures call back to their ancient traditions, having deep respect for the wisdom passed down generation to generation. Both cultures also share a love for some of the same traditional ingredients, from matcha to rice to camellia oil. Korean beauty also regularly features hanbang ingredients, which are traditional ingredients that have been passed down through generations; brands like Atoclassic have even built their brand identities and philosophies around these hanbang ingredients. Even outside of beauty, it’s still common for Koreans to turn to medicines called hanyak made of these very same ingredients, with recipes for all kinds of bodily needs, from acid reflux to inflammation to pregnancy-related issues, amongst others. Of course, there are differences. Japanese beauty is, indeed, more about minimalism and tradition. The Japanese beauty approach is to lean more towards functionality and simplicity. It tends more for products that do multiple things in order to pare down a skincare routine, as opposed to the more involved Korean 10-step routine, and keep it thorough but minimal, a reflection of Japanese culture itself, which can often include a sense of quiet, stoic politeness. It is a beauty approach that is slower, considering beauty as something that takes time, patience, and consistency over a longer period of time. Japanese beauty also tends less towards “hot” and “trendy” things, opting for ingredients that are more rooted in tradition and have that long-standing foundation in its history and culture. Korean beauty loves to innovate. Korean beauty does indeed look more forward, with R&D beauty labs constantly innovating, looking for new ingredients, and developing new products. Korean consumers are highly invested in their skin, and their demand for gentle and effective products that also have positive sensorial qualities unsurprisingly keeps the industry highly competitive and drives it forward. 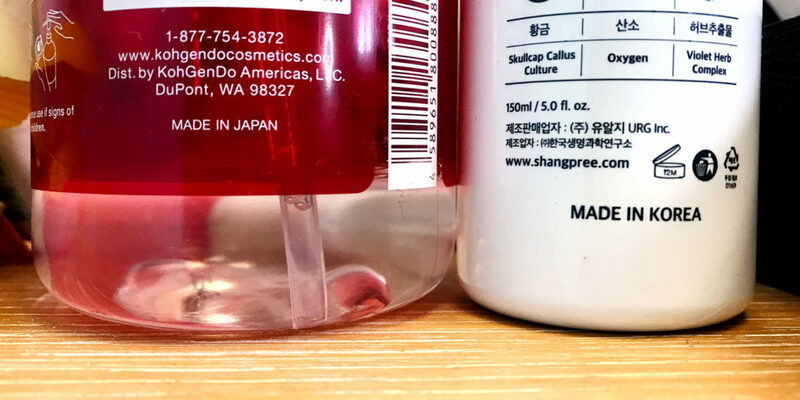 While Korean beauty also understands and shares the prioritizing of routine and consistency, Koreans like to try new things (hence, the constant innovating), and they do consider efficacy in products, wanting products that work and show results quickly. That means that Korean beauty may cycle through things more frequently than Japanese beauty, as Korean consumers constantly look for what is new and better and improved. To be sure, Koreans do love their trends, and, when something takes off in Korea, it really takes off. That doesn’t necessarily mean there’s nothing of substance driving the trend — snail extract, for example, was a huge trend a few years ago, and, as it turns out, there was a reason for that, given snail extract’s ability to brighten, calm, and hydrate skin while also providing anti-bacterial qualities. Both Korean beauty and Japanese beauty want you to know your skin. Glowing, healthy, radiant skin is about knowing your skin and personalizing your skincare to nourish, balance, and hydrate it according to your individual skin needs, and both Korean and Japanese beauty understand that skin health begins with that knowledge and intentionality. Consumers in both countries take the time to educate themselves about skincare, personalizing their routines to address their skin concerns and, thus, work towards maximum skin health. But what does this all have to do with you and your skin, dear reader? Forget about the debates and the discussions, and listen to your skin and give it what it needs. There is no one-size-fits-all in skincare, just like there is no “right” approach to beauty. In the end, it’s about what you need, and, here, you have these two approaches to beauty steeped in centuries of tradition, practice, and wisdom — so listen to your skin, and reap all the benefits offered from Korean and Japanese beauty as your skin needs!